This February, VIBE Arts earned an outstanding opportunity, in collaboration with community arts organizations RISE and Freedom Fridayz, to host a three-part series of Black History Month programming. Funded by Canadian Heritage, The Chronicles series set out to honour the legacies of Black Canadians, past and present, through artful activities, activations, and conversations. Part one of The Chronicles took place at Oshawa’s Eastview Boys & Girls Club on Monday, February 11th. This iteration featured a group of VIBE Artists who performed African drumming, dance, and beatboxing before leading participants in hands-on activations in head-wrapping, visual arts, Caribbean folk and West African dance. 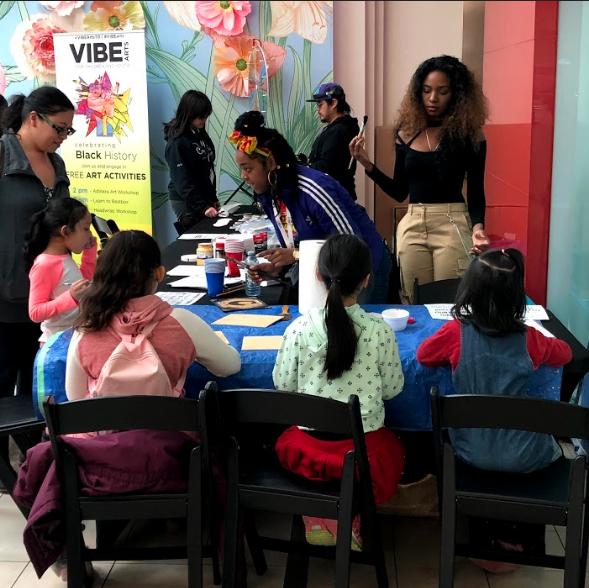 The second installment of The Chronicles took flight at Scarborough Town Centre on Saturday, February 23rd, and had VIBE artists performing on the Scotiabank Live Stage. Monique London kicked off the festivities with a musical performance while VIBE Artist, Shashann Miguel-Tash, led an arts activation on Adinkra symbols. Other performances included African dancing and drumming performance by VIBE’s CoCo Murray (of CoCo Collective) and VIBE Arts Drum Maker and Master, Saikou Saho. The final event took place at Black Creek Community Health Centre at Yorkgate Mall, on Monday, February 25th, where a panel discussion dove deep into topics of resiliency within Black History and the surrounding community. Thank you to those who supported, participated in and engaged with VIBE Arts’ Black History Month programming. The Chronicles was proudly funded by Canadian Heritage. At VIBE Arts, we have been building relationships to expand the reach of our impact. In 2017, we worked with national partners and participants for our 150+ Reasons We Love Canada project. This winter, VIBE has had the privilege of collaborating with Indigenous artist and arts assistants, in Northern Ontario communities, to design a series of programs for Indigenous children and youth. Funded by the Ontario Trillium Foundation, Boreal Creates is a three-year project that offers a variety of art programs in Sioux Lookout, Thunder Bay and Sault Ste Marie. Youth participating in VIBE Arts Boreal Creates workshops, Winter 2019. So far in 2019, Boreal Creates has culminated in three programs: a Jean Jacket Art-making workshop at Baggage Building Art Centre; watercolour and acrylic painting at Pelican Falls First Nations High School; and traditional lacrosse stick and snow snake making at Kina Awiiya Secondary School. VIBE Arts looks forward to continuing to build and strengthen relationships with communities across Ontario. We have several more Boreal Creates projects on the horizon, and we acknowledge and feel grateful for the ongoing support of our northern partners in making Boreal Creates possible.